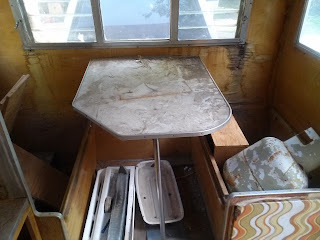 On-going vintage camper rebuild. Restoring 1961 Mobile Scout canned ham camper. Memorial Day Weekend 2017 began with a bit of sadness at the loss of one of my favorite musicians, Mr. Gregg Allman. 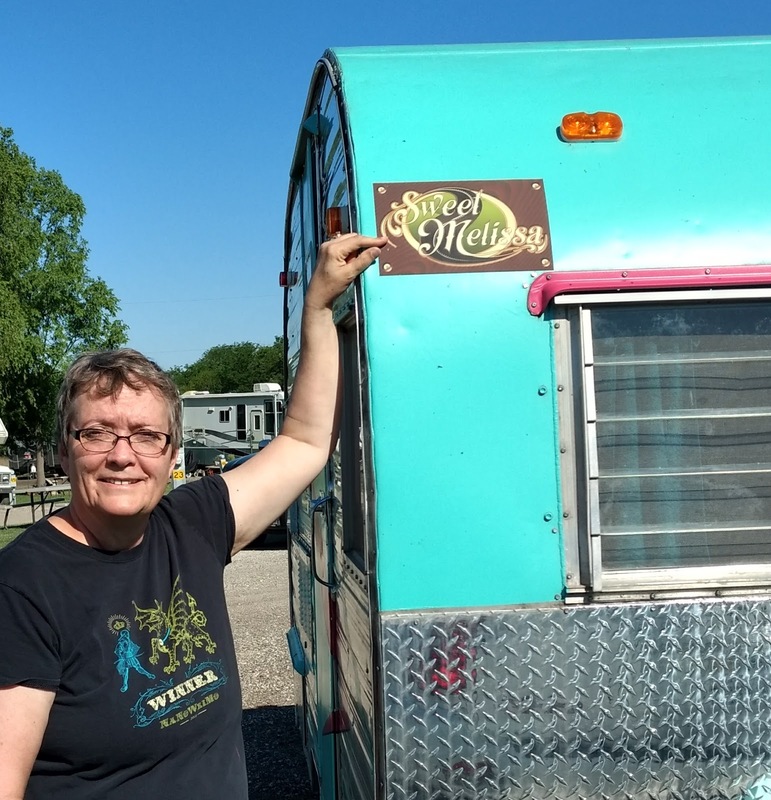 You may remember that our 1961 Mobile Scout Camper was christened Sweet Melissa after a line from a song by the Allman Brothers Band. 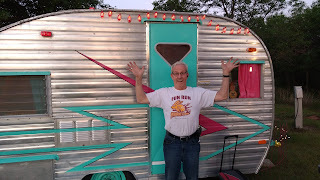 My heart said, "This one's for you, Mr. Allman" and we moved into Mobile Scout Camping Adventure #3, to our state's capital, Topeka, KS. 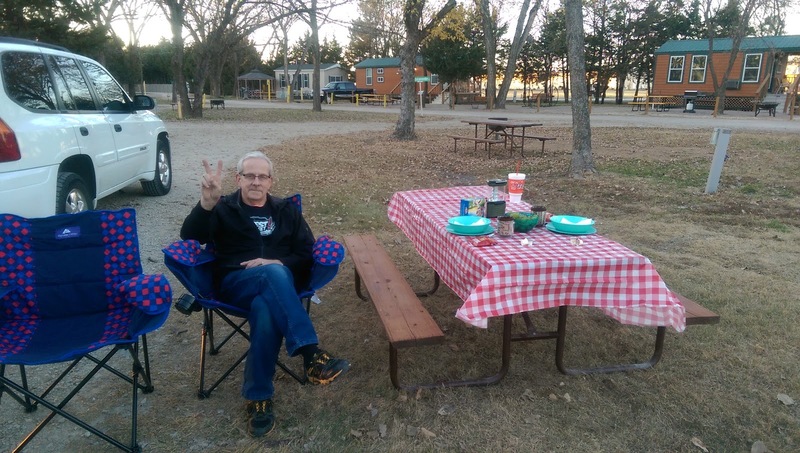 We chose to camp at Topeka/Capital City KOA, for a couple of reasons. 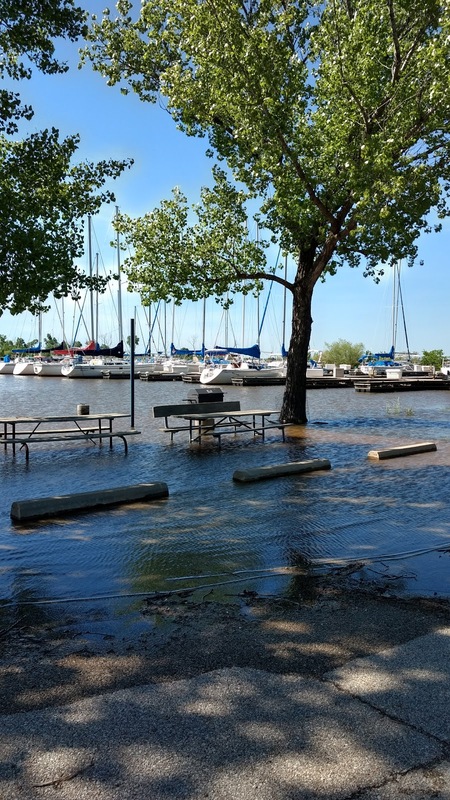 First, the lakes around Wichita have experienced flooding, cutting the Memorial Day Weekend campsites down so much that, if you weren't camped there by mid-week, you didn't have a campsite. Second, we're KOA Value Kard Rewards members and we'd read on their website about the Topeka campground's unusual features. 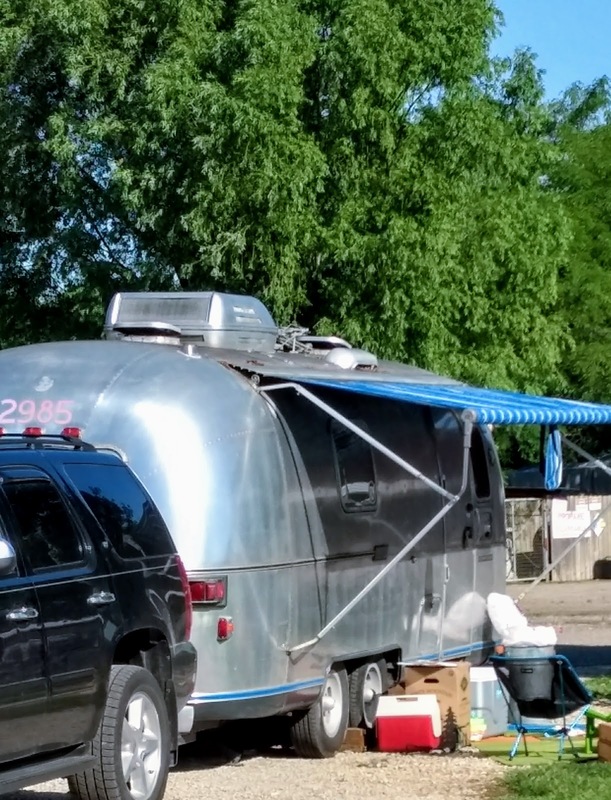 What could possibly be unusual enough about a campground that we'd drive one hundred fifty miles to see it? Well, a barn, for one thing. 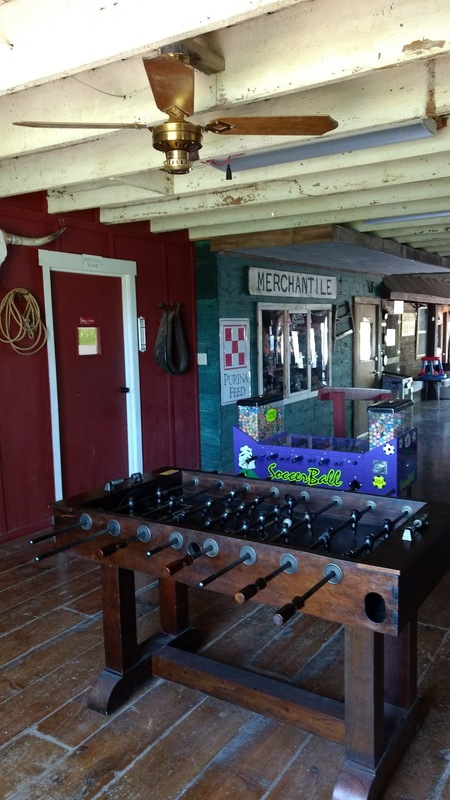 The family that runs this KOA moved a vintage barn to the campground and restored it beautifully, creating a camp store/office, game room, reading parlor, workout room, and space that can be rented for special events. It added a nice touch to an already scenic campground. And then there was the hiking trail that wound up a hillside, where a mama killdeer lured us away from her nest with their trademark broken wing ploy. The hike also revealed a number of quartzite boulders that fascinated The Hubs, aka The Science Nerd. What else did we like about this campground? Three onsite fishing ponds provided our fellow campers plenty of angling action. It was nice to see the glow of their lanterns around the bank after sunset. Got to get that fishing gear packed in the camper! The feature that attracts the most business for this campground was their new saltwater swimming pool. We didn't indulge on this trip, but it seemed to draw a steady stream of happy swimmers. The campground hosts advertise their KOA as a family-friendly destination, and it surely seemed to be. 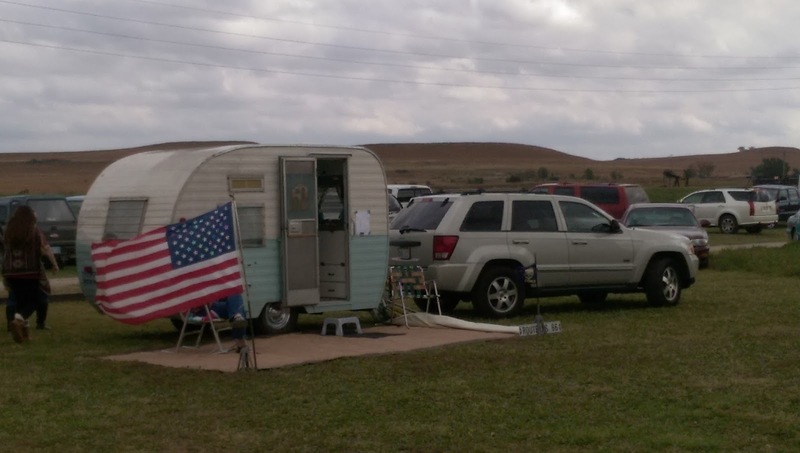 There were large family groups taking advantage of the tent sites right next to the water. There were enormous fiberglass relatives of Sweet Melissa, the only inhabitants of which seemed to be the kiddos who made a dash to the pool several times a day. We think their parents were enjoying a holiday weekend in RV luxury, and we don't blame them a bit. There was also a contingent of bikers, friendly guys on sweet rides who camped down by one of the ponds. A bonus for us--a vintage Airstream right across the road and a new Shasta Airflyte reissue that was cute as baby cheeks. How'd Sweet Melissa do on a three-day excursion? 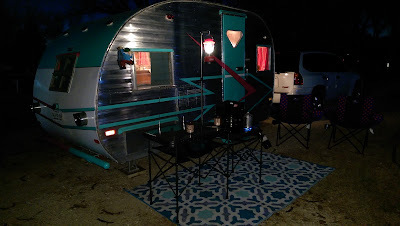 She did a great job, after we figured out some adjustments we'll need to make for future camping. One, we installed the AC and 12v/110v fridge a little too close together and the resulting heat made the fridge fretful. 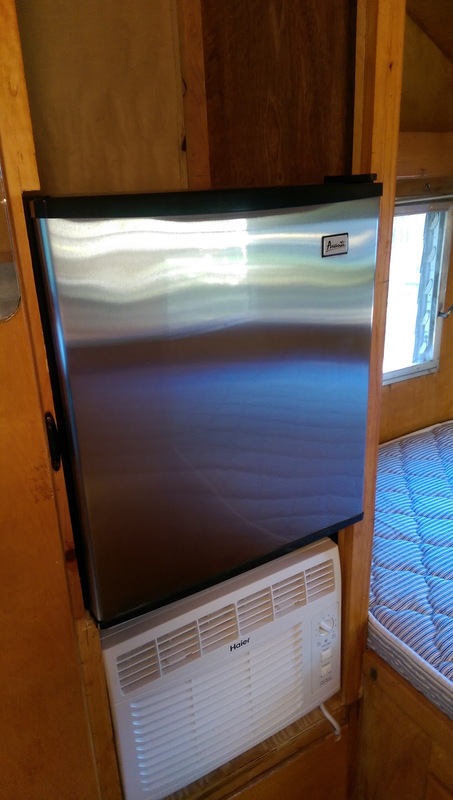 So, rather than make his wife choose between AC and refrigeration, The Hubs figured out where to move the fridge as soon as we got home. In the meantime, we saved the AC for evening and packed the food in ice overnight. Worked just fine. What else? Had to make a couple adjustments to the sway control to keep the ride smooth. That and a bit of drama with a dead battery (really, really dead, as in "cannot be resurrected") in the parking lot of Casey's General Store in Emporia, KS made me SO glad I married a forty-year mechanic! But the drama was worth it, because we also shared early morning meals cooked at the campground, hiked through beautiful Kansas prairie and met some awfully nice people from at least ten states. 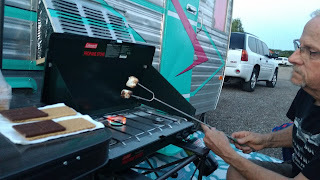 We toasted marshmallows for s'mores by the flame of our Coleman camp stove because our fire ring was mysteriously missing. Turned snack time into an adventure, so no harm done! 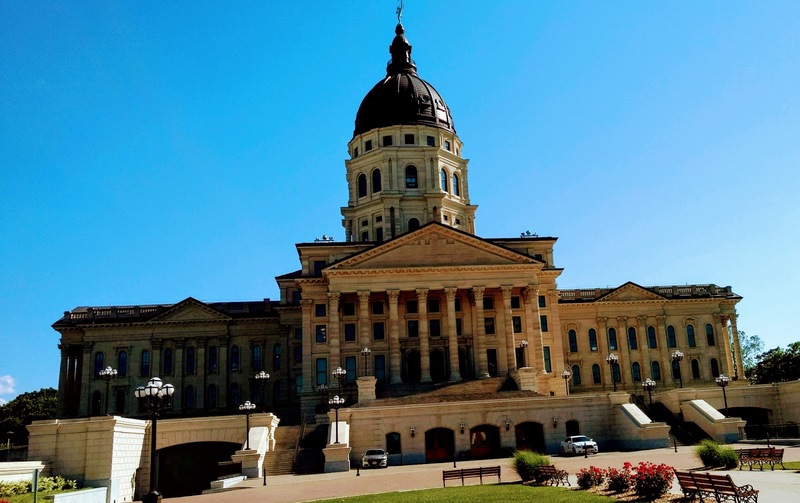 and came back with all sorts of interesting facts about our spectacular Kansas State Capitol building. 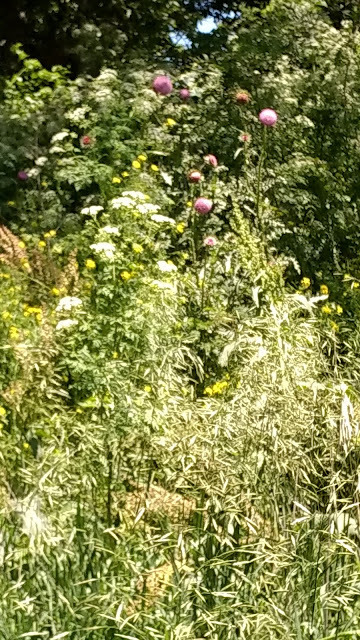 And we remembered, as we drove through the Flint Hills on I-70 and heading home along Hwy 50, how awesomely scenic the Sunflower State can be. 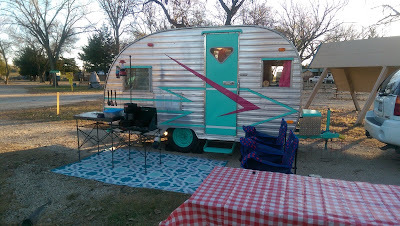 We'll visit the rocky valleys near Topeka, Lawrence and Manhattan again, and look forward to more tales to tell of camping in Sweet Melissa. I Forgot!! A big victory also took place this weekend! I learned to tow the camper! 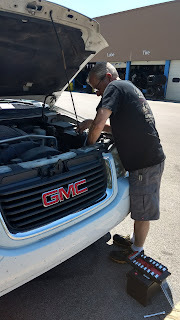 I've been skittish about driving the Envoy with Sweet Melissa in tow, but The Hubs was struggling with allergies, so Memorial Day Weekend on two interstates was my trial by fire. Terrified of flying off the face of the Earth at first, but once I'd gotten used to her wobbles and the way she pushes you when you're braking, I actually did okay. About 150 miles towing experience under my belt, so one more camping obstacle overcome. Woohoo! At last--the winter cover's come off Sweet Melissa and we're geared up for 2017 camping season! You may remember that we took our 1961 Mobile Scout vintage camper on a test run to Salina KOA last November. 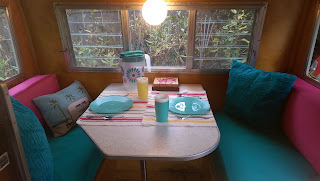 After that successful camping trial, we had to say goodbye to camping as winter weather set in. But it's beautiful here in the Sunflower State once again, and we had our first excursion of the season on Mother's Day weekend. Didn't go too far this time--just about thirty miles west of the homestead to Cheney State Park. 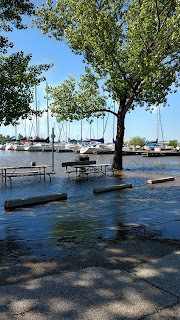 Some last minute drama as recent epic rainfall caused east shore camping areas at Cheney Lake to be flooded. We were determined to camp, nonetheless, and left home Saturday morning with Sweet Melissa in tow. When we reached the lake we found, with the help of a buddy who had already set up camp, two west shore loops with open campsites. We chose the North Loop and couldn't have had a better camping experience. Did I mention we decided to take our two senior citizen dogs along? 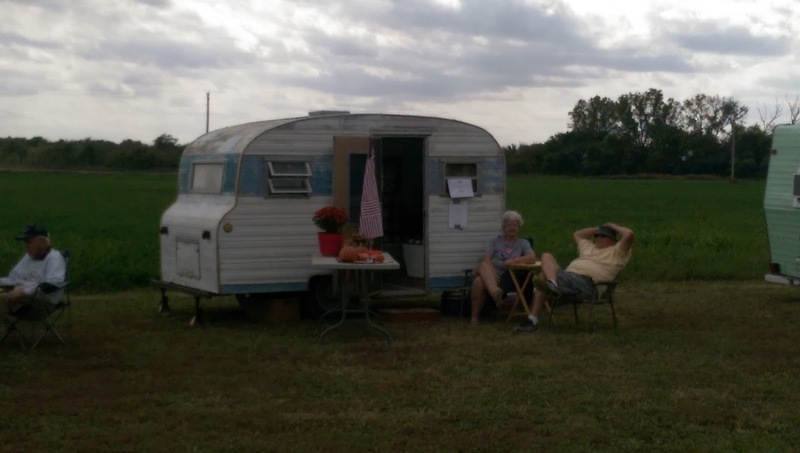 They're as new to camping as we are, so we wondered how they'd like the experience. No reason to worry! Happy and Daisy hung out at the campground, took long walks with us and generally took to camping like they'd grown up at a KOA. 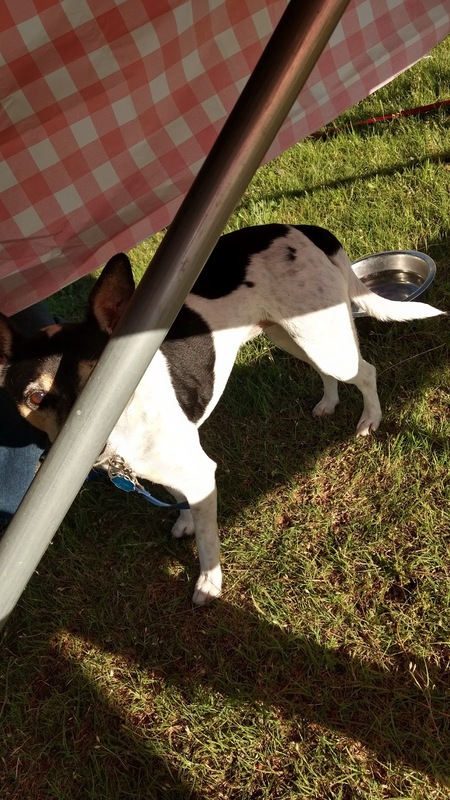 So now some particulars about our camping experience. 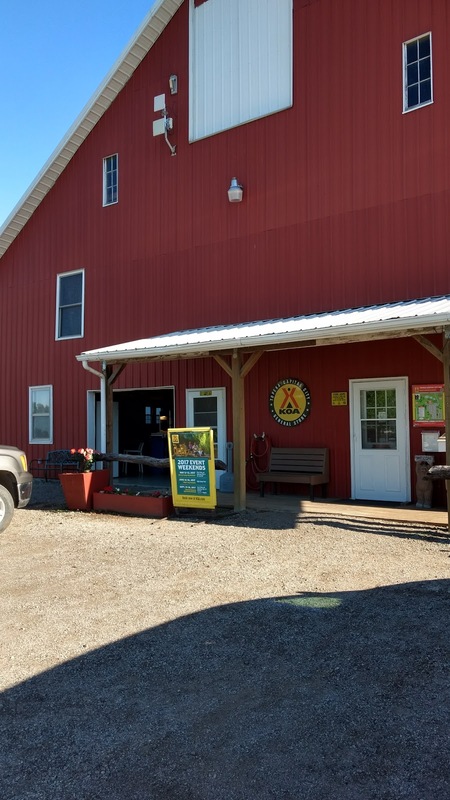 Why did we enjoy Cheney State Park? It was PEACEFUL, a prairie park with a fifteen-square-mile reservoir, hiking trails and super-friendly camp hosts. The Ninnescah Sailing Association calls this lake home, so a stroll through the sailboat marina was also fascinating. There's a boat launch/marina for powered boats on the other side of the lake. The Hubs got to watch some impressively speedy boats skipping across the waves. 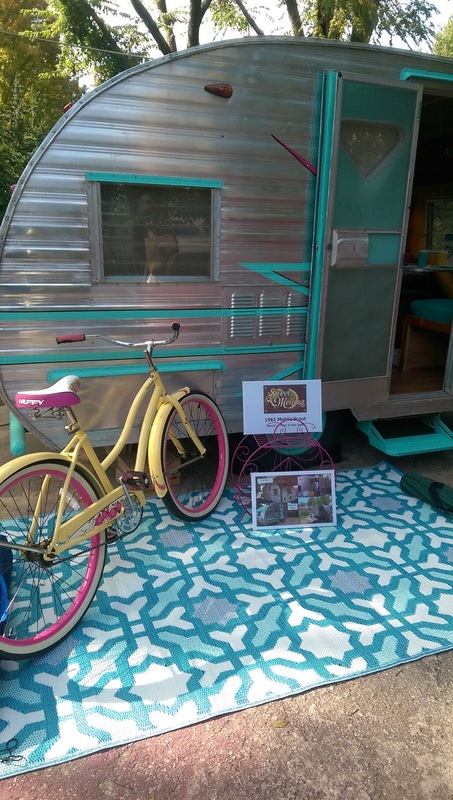 How did Sweet Melissa do as our home away from home for Mother's Day weekend? She was marvelous! We tweaked some routines and learned some shortcuts that will come in handy on future trips. 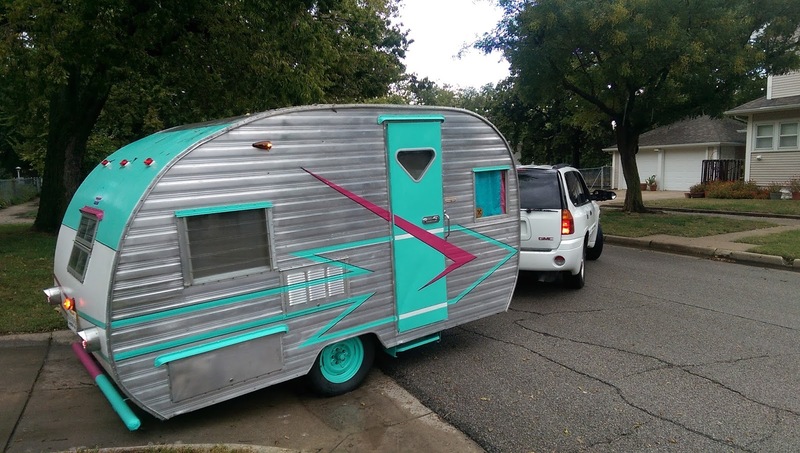 She towed like a dream, even with a wild, Kansas crosswind bumping against her. One of this blogger's favorite parts of camping so far is cooking outdoors. I also found that using our recently-purchased three-in-one toaster oven, grill and coffee maker was a nice option early in the morning. We're learning to use ingredients for multiple meals, to save room in our small fridge. We really didn't have any complaints, other than not having another day to stay and relax at the lake. God bless the folks who camped around us in rigs that made our baby look like a children's playhouse. They seemed to be having a good time, too! We decided there's more than one way to camp, and we're glad we have the freedom to enjoy ours. More than anything, we enjoyed the community of campers. People stopping, waving, even working together to secure an awning while the owner was off at work. It was what we've been hoping it would be when we finally got to start camping. We've got the fever now and plan to creatively include our vintage trailer in most future travel. 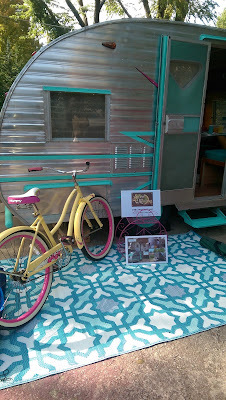 We're scheming our next camping vacation as I write, so watch for Sweet Melissa at campsite near you! In our last post, we hinted we'd be camping soon, and it's time for the big reveal on our first camping adventure. You see, Sweet Melissa still needed to go through the 'what would it be like to actually spend the night camping in her' exam. In Kansas the state parks and lakeside campgrounds start shutting off the water supply this time of year, so we opted to make our first foray into camping together an 'urban camping' experience. 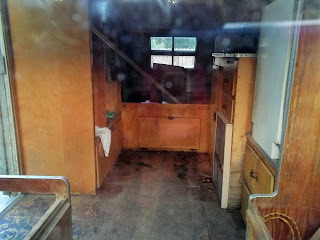 Not too far from civilization, but somewhere we could set up the camp kitchen, test Sweet Melissa's refurbished heating and electrical systems (and insulation!) and simply get away from home for a weekend. So we chose Salina KOA, a friendly place ninety miles from home, and headed up the interstate in search of adventure. Here's our review of how camping in a vintage camper went at this KOA location. 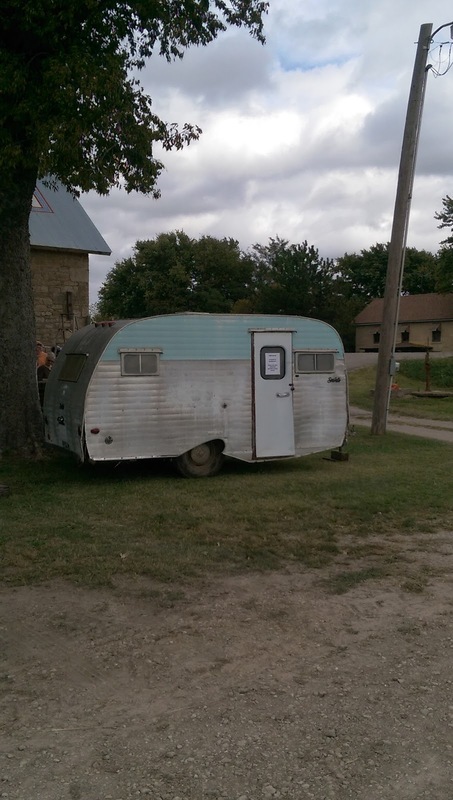 We hope it helps folks on the road near Salina, KS feel good about choosing this spot for an overnight stay. 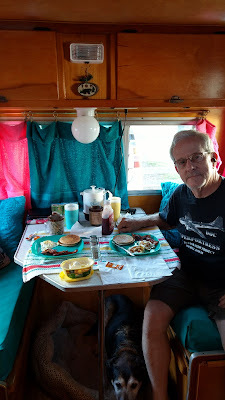 What was important to us, camping as we were in a no-potty, fifty-five year old canned ham camper, was how close we could camp to the restrooms! We are pleased to report that these restrooms would pass muster with the fussiest housekeeper--clean, well-lit, only accessible with the key code given at check-in AND there are three private showers with dressing rooms in each restroom. Camping Confession #1: We hadn't brought along the portapotty, so we giggled our way through the campground together at 3 a.m. to use the facilities. Ahh, the memories! 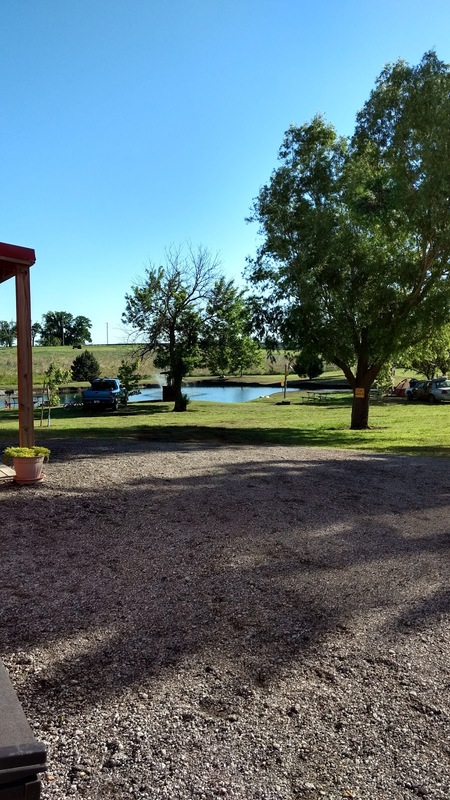 Overall impression of the KOA in Salina, KS: Pros: easy to access from the interstates, close to restaurants and shopping if you need them, clean, well-maintained facilities, friendly, helpful staff and easy-to-navigate campground with all pull-thru campsites. If you're not into trailer or tent camping, the cabins looked plenty comfortable, equipped with outdoor grilling kitchens and patios. Cons: traffic noise from I-70. Now on to our travel report for our first-ever camping experience in Sweet Melissa. 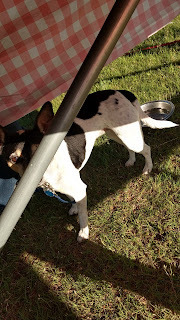 To this blogger, there's nothing quite like a meal cooked outdoors, so it was important to me to get the cooking facilities set up first thing. 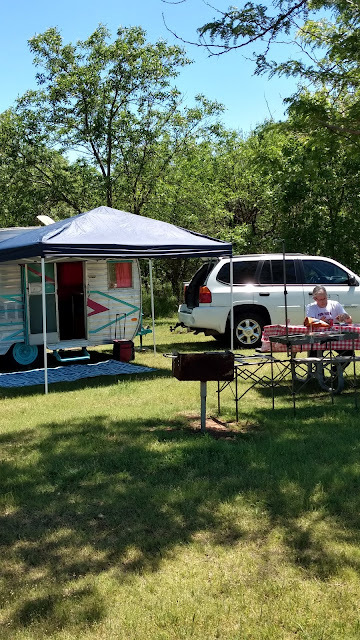 I mentioned in an earlier post that we'd purchased an Ozark Trail Camp Kitchen and this was its trial run, away from our driveway. I'm pleased to report that the kitchen served its purpose well. It's compact and easy to stow and the Hubs set it up in less than five minutes. 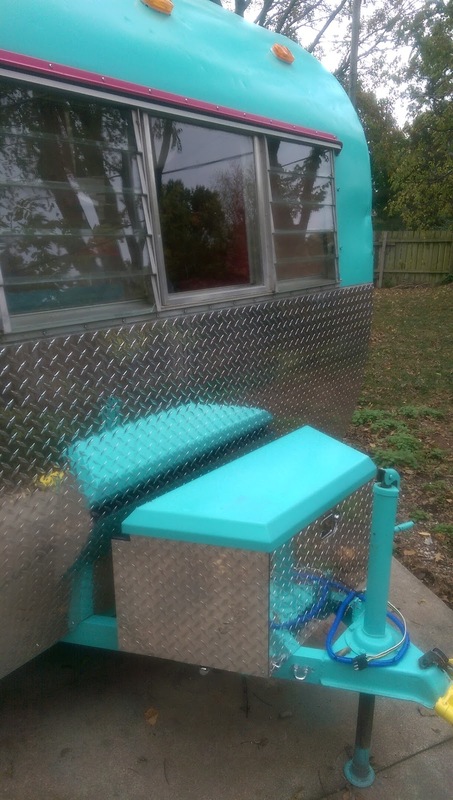 It's also plenty sturdy, meant to hold a camp stove on one end and provide a food prep surface on the other. 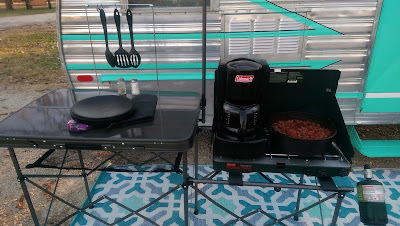 Here's a pic of what it looked like, complete with our evening meal of Dutch oven chili and coffee brewed on our Coleman camp stove coffeemaker. Did we mention the temperatures plunged into the 30s overnight? That became important an hour after sundown when sitting outside, even in our cold weather Ozark Trail camp chairs, became uncomfortable. We opted to hang out together in Sweet Melissa's cozy dinette, reading and talking and relaxing away from television, work and other distractions. At bedtime we cracked a window for ventilation and lit the Mr. Heater Portable Buddy catalytic heater. The camper, I'm happy to report, stayed toasty warm all night. Consumer tip: if you use this heater with small propane bottles, you'll have to change the bottle after running it six hours on low heat. At some point, if we decide to do a lot of cold weather camping, we'll hook it up to a larger bottle. Early the next morning, we set up the Coleman stove again and cooked breakfast in the great outdoors. Was it chilly? 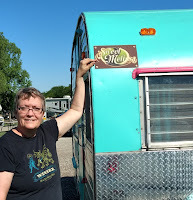 Yep, but it was also fun, and we followed it up with a stroll around the campground to gaze at RVs big enough to hold Sweet Melissa in their kitchens. Then it was a quick trip through those squeaky clean showers and then off into town to check out the local attractions. 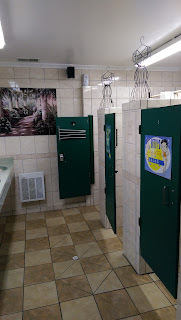 We can highly recommend Jalisco Mexican restaurant, straight down Ninth Street from the campground, just past the Central Mall--friendly service and great food. 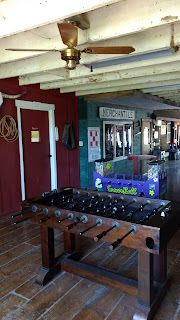 We'd chosen to pay for an extra night so that we could hang around after the 11:00 a.m. checkout; still cheaper than a hotel room and it took the pressure off of us to dash home midday. We wandered back to the KOA late afternoon and broke camp. Headed back down the highway to Wichita by the light of the rising super moon, ready to plan our next camping excursion. We learned a lot this past weekend, what not to pack next time and what we forgot, quicker ways to set up and break down camp and how long it takes to cook a meal on a camp stove. We learned that the checklists we'd created for safe set-up and break down of camp were not obsessive but necessary. We also learned that we love camping together. And here's what we've decided after camping overnight in the city limits...it's a comfortable, less expensive alternative to staying in hotels when there's a city we hope to visit. 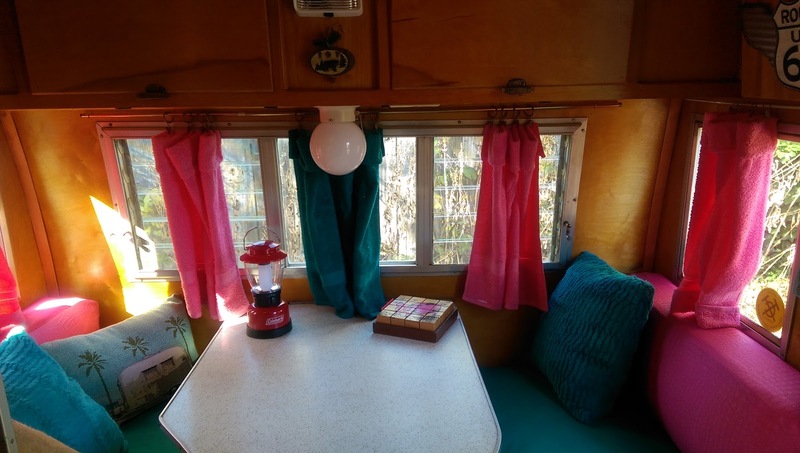 With KOA campgrounds (and other 'vintage friendly' possibilities) spread across the country, we love the idea of taking along our 1961 Mobile Scout on our adventures. We aren't locked in to being urban campers, lake campers, national park campers or 'off-the-grid' campers, but we hope to experience all those kinds of camping in the coming years. We're leaving our options open to all the ways we can enjoy Sweet Melissa as we travel. 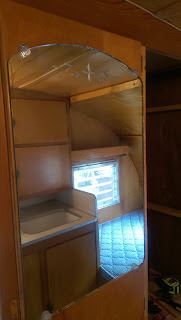 You know the part where I said we wouldn't be posting again for awhile about camper rehab? That was just for fun. 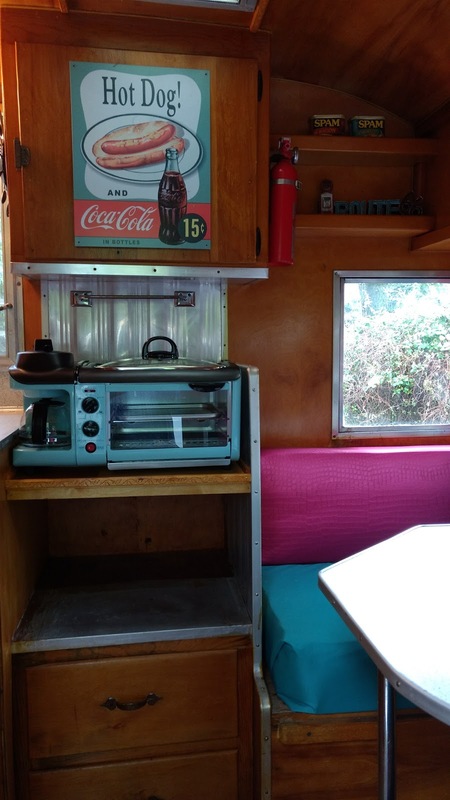 As someone told us recently, you never quite get finished perfecting your vintage camper. 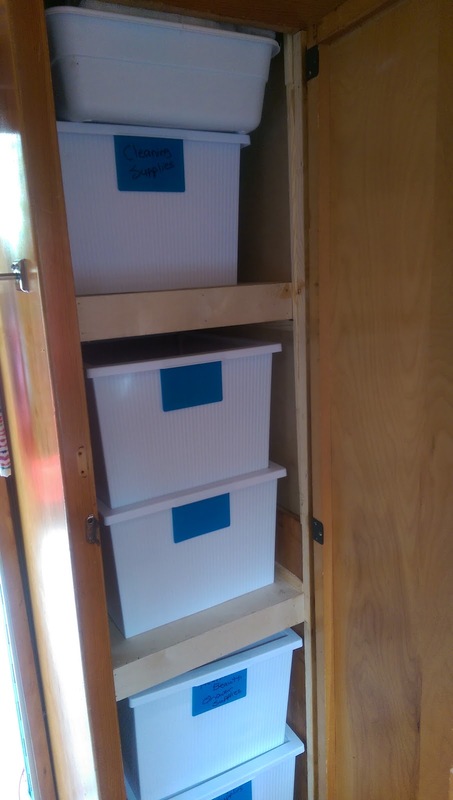 The past couple of weeks, the Hubs has been hard at work completing the 12v system so we can camp without shore power. 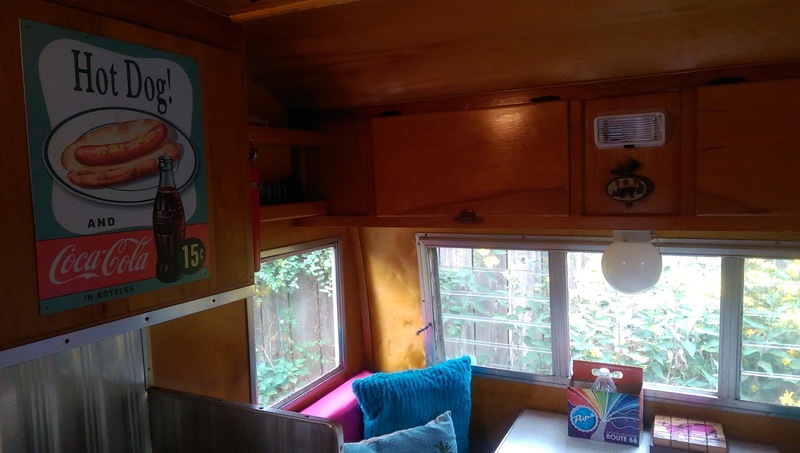 His latest awesomeness was to customize a Harbor Freight tongue-mount box to match Sweet Melissa, and also hold the two deep cycle batteries to power that system. I think he did an amazing job, myself. 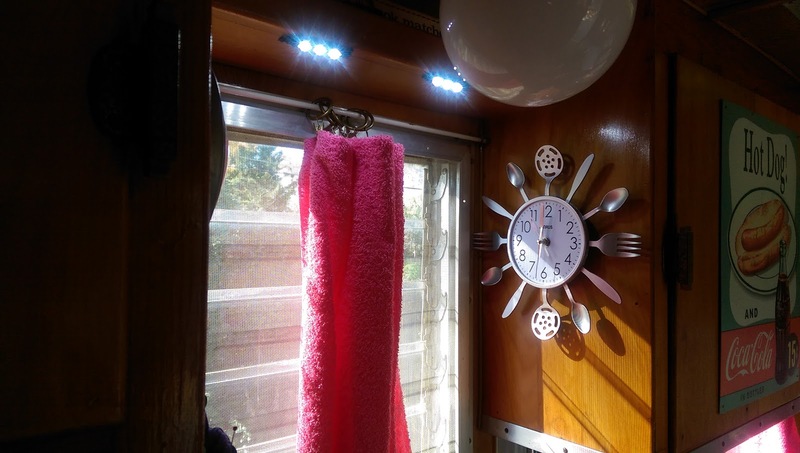 His next task was to connect LED strips under the shelf at one end of the bed, on the over-sink shelf and above the dinette. We tested them that night and they give off plenty of warm, comfy illumination for camping 'off the grid'. Remember that nifty Avanti fridge we bought that runs on 12v or 110v? 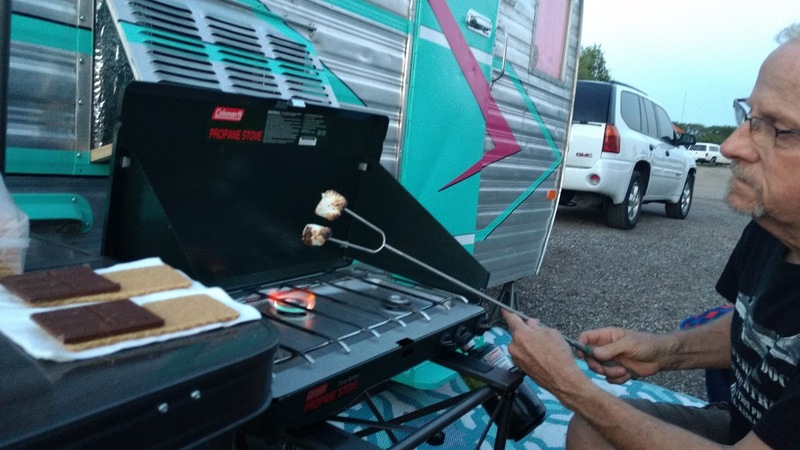 He's got that hooked up, too, so that we'll have food safety without coolers no matter where we camp. He's also taken care of our old, leaky roof vent with the installation of this new one, purchased at Trailer Parts Supply in Wichita. The fan is hooked up to the 12v system, as well, so even if we're camping far from electricity, the air can flow freely. 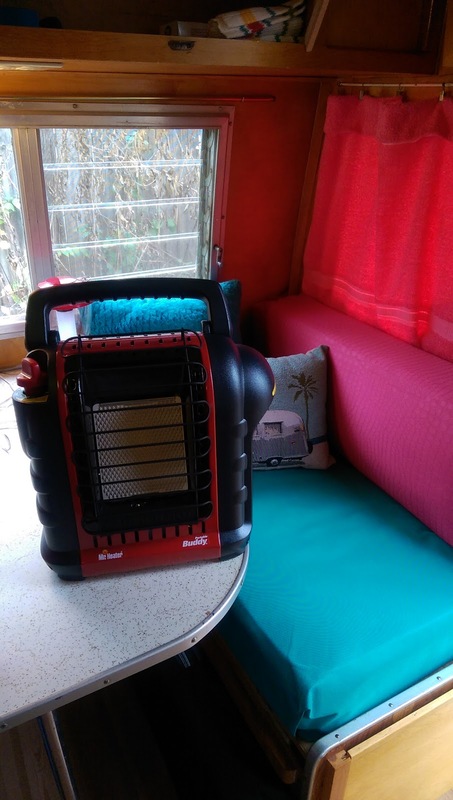 Which is particularly important with the addition of our heating system, a Mr. Heater 'Buddy' propane fueled catalytic heater. 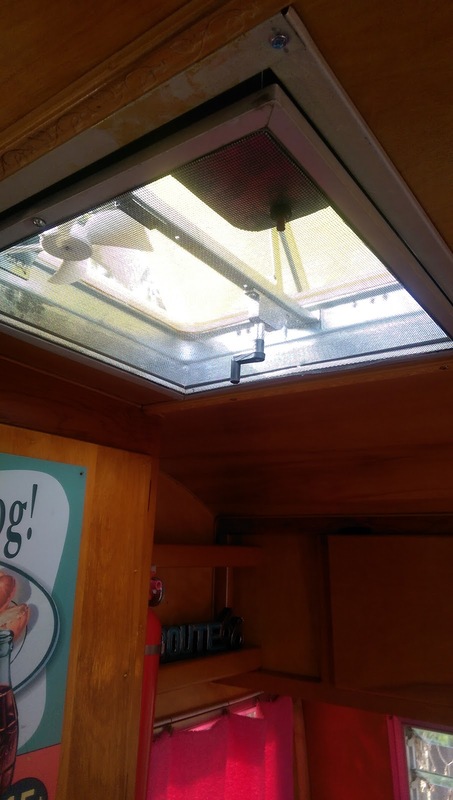 Great to use in a camper IF you provide adequate ventilation while it's running and IF you install a carbon monoxide detector. The new ones, like ours, have an auto shut-off feature if the C0 level gets too high, or if the unit gets knocked over, but we believe in being extra safe. What else have we accomplished? Oh, yeah, curtains! 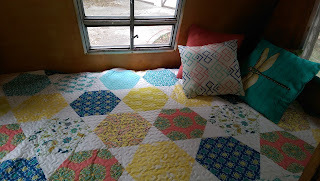 While my seamstress-new-mother-of-twins-systems-administrator-just-sold-her-house-and-moved daughter takes a well-deserved break from sewing the REAL curtains for the camper, I had to come up with something reasonable to cover all those windows. Especially since WE'RE GOING CAMPING! Stay tuned for more on that after the weekend. I went to the source of all things crafty, Pinterest, and found a page that showed how to make curtains without sewing. Then I made a(nother) trip to Walmart and bought pink and aqua towels for $2.87 each. Since I made two curtains with each towel, those are pretty cheap window coverings, even adding in the iron-on hem tape. I know, I know, my seamstress wizard fellow glampers are going crazy right now, but for a girl who can't sew a seam, I thought they were pretty cool as a temporary solution! So, with the bins packed full of groceries, first aid supplies, health and beauty stuff, extra propane cylinders and tools, we are ready to roll on our first camping weekend. 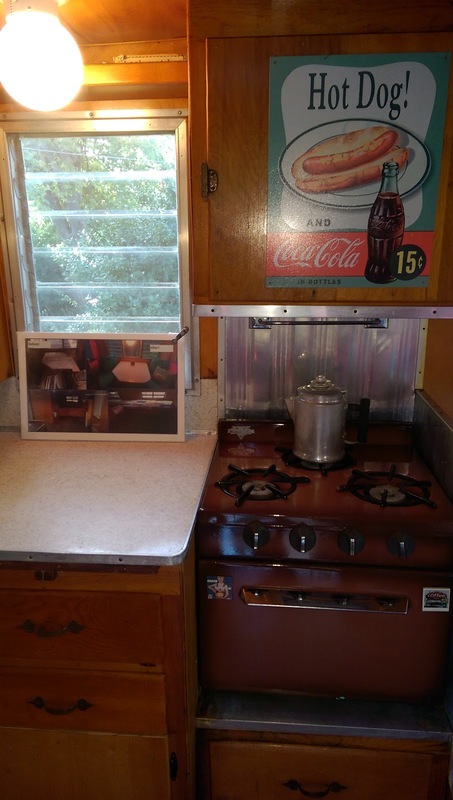 We'll post pics of our Ozark Trail camping kitchen that's perfect for holding a Coleman stove and everything I need to cook at the campsite, when we do our first camping blog. Looking forward to the weekend, fellow campers! It's been an amazing week for Sweet Melissa's rehab team! 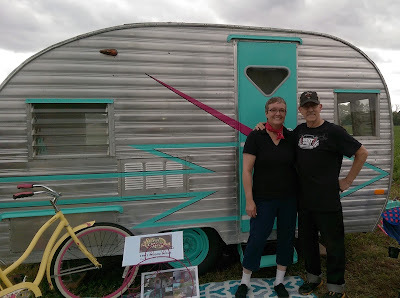 The Hubs and I pressed forward to finish the final details as the day of Stone Barn Farm's Vintage Camper Show in Dexter, Kansas drew near. 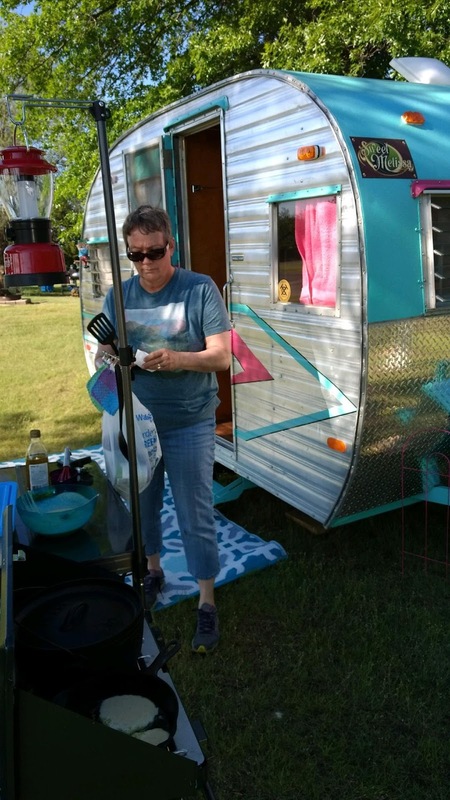 Burned some serious midnight oil doing things like last minute paint touch up, getting an official weight certificate from the public scale, cleaning the camper one more time, purchasing a spare tire and deciding how to stage the Mobile Scout for the show. 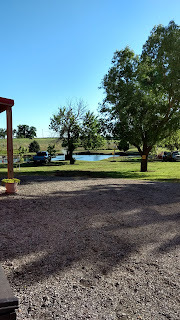 Early Saturday morning we pulled out of the driveway and rolled down I-35 and US-160 to Dexter, KS, by way of Oxford to pick up a fellow camper and sister-in-law. Sweet Melissa pulled straight and true at 65 mph, in spite of some serious crosswind. 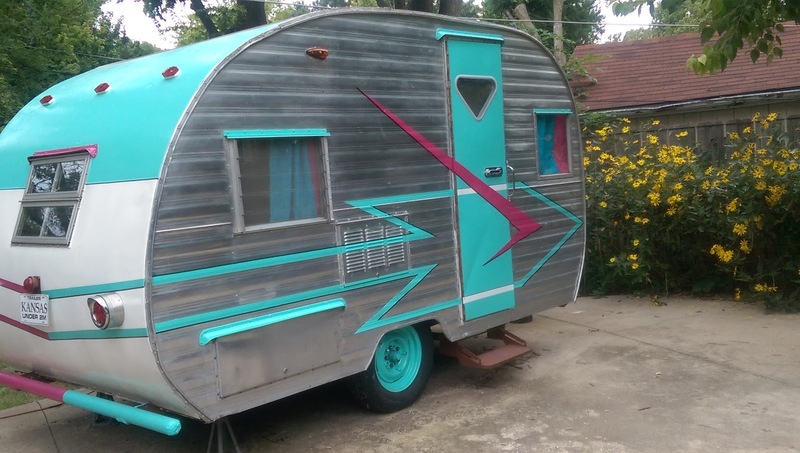 So glad to know she'll be easy to tow to the campground! It was the Field of Dreams for the two of us, being greeted by the sight of a field full of canned ham campers.This little beauty, for example, was outfitted as a food trailer. Pretty eye-catching, don't you think? 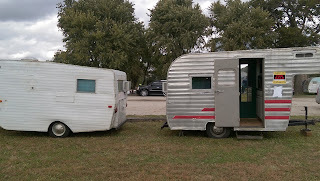 And this gorgeous trio of trailers was glamped to the max by some savvy women who'd come down to camp the night before. We gained a lot of inspiration by talking to the owners and feasting our eyes on their accomplishments. Equally inspiring were these classics, including a clever little 1930s teardrop, whose owner also creates custom teardrops to suit his customers' needs. God bless Yankee ingenuity! Even our hostess for the camper show got into the act, bringing out her Serro Scotty as a 'before' showing before she starts her rebuild. Our neighbors for the show are bringing this classy canned ham back to life and added plenty of color and fun to the day. Also had a great time looking at the campers brought to sell at the show. 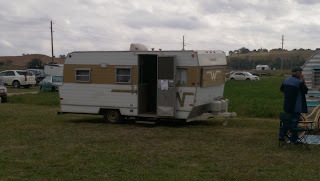 The white and tan Winnebago sold that afternoon! 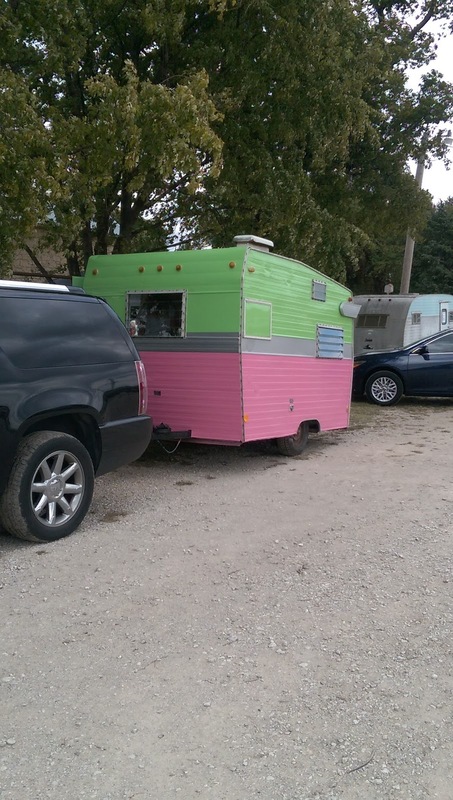 Can't wait to see it prettied up later on down the road. This is a good time to tell you that Sweet Melissa won an award! She took second in the show, right behind Krickett, this spiffy Comet from Fort Scott, KS. What a beauty! One more camper photo to share, a sister Mobile Scout. 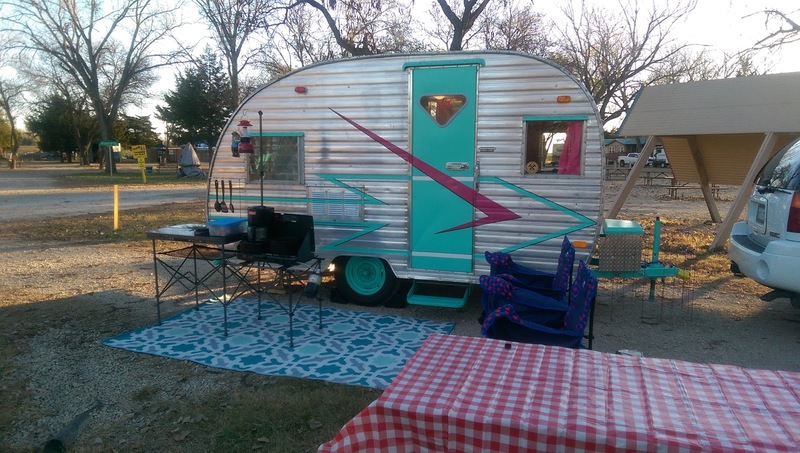 She's a 1962 10' model, cute as a bug and owned by a fellow Wichitan. 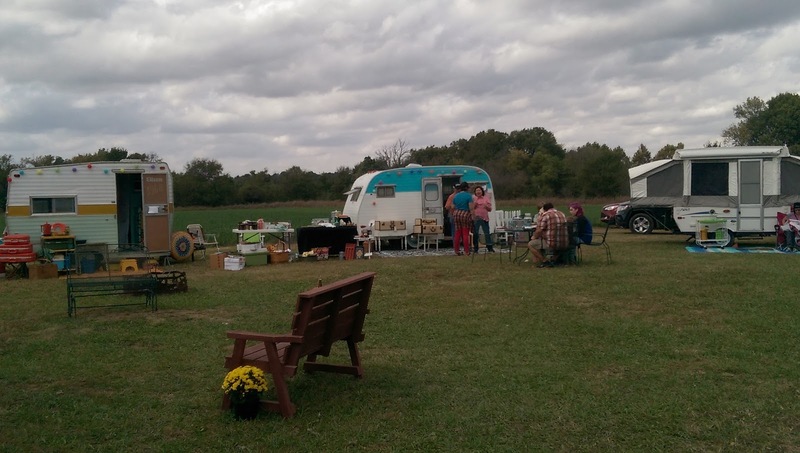 The Hubs had a great time swapping camper lore and repair tips with the owners. All in all, a fantastic first outing for Sweet Melissa. Fourteen months of crazy, grubby, knuckle-scraping work and we're overwhelmed by how well she turned out. Would we do it again...hmmm, maybe. But it's going to be awhile before we take on that big a project again! Here are just a few more pics of the second place princess in all her glory. I've added BEFORE photos for comparison. A little better, don't you think? Thanks for hanging in with us as we stumbled, fumbled and prayed our way through her rehab. 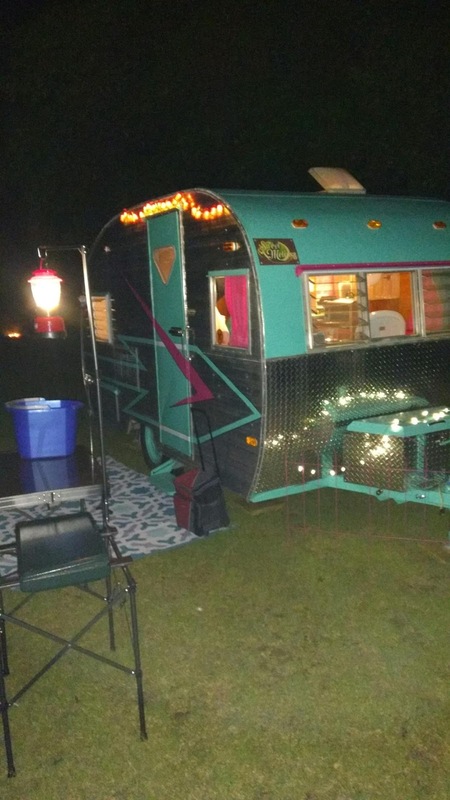 We've got a bit of fine tuning to do, now that she's been road tested (better clearance lights, adding sway control), but for the most part, she's ready for the campground. 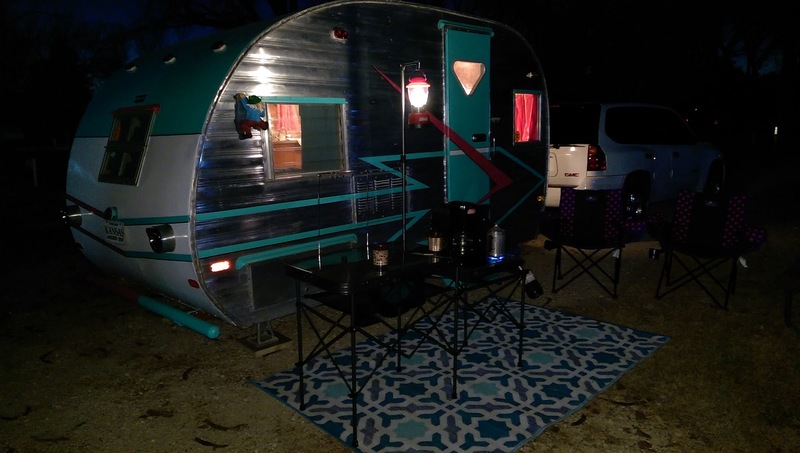 Stay tuned for our camping adventures! So, remember all those details we discussed on the last post? Well, an impressive number of them have been checked off my legal pad in the past couple of weeks. Things like rehanging vintage mirrors on the pantry door and adding a few more vintage accessories, like this metal Coca Cola sign we bought in Galena, KS while visiting a Sisters on the Fly camper show. 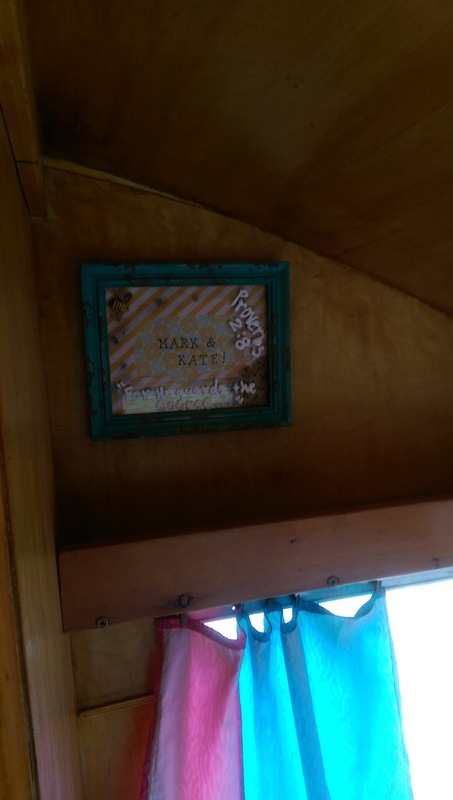 We're also blessed with talented friends who gift us with personalized camper decor for Sweet Melissa. Thanks Heidi! 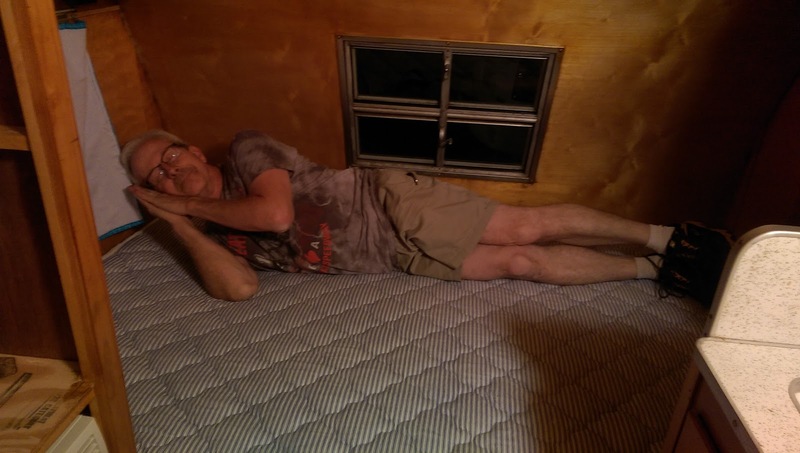 One more happy progress note is receiving the mattress we ordered and finding it a perfect, comfy fit. Now if I can talk the Hubs out of taking naps while he's working! One of the best things we've discovered about working the past fourteen months bringing Sweet Melissa back to life is the interest and pleasure it generates in family and friends. We hope that someday soon our growing tribe of grandchildren can accompany us on camping adventures. 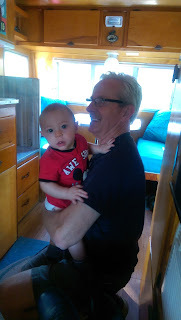 Right now, the Hubs was simply happy to share a vintage camper moment with the grandson. Almost forgot! We found the right fridge to fit in the cabinet that once housed the original propane one (with a little coaxing and some reconstruction). It's an Avanti AC/DC Superconductor, meaning we can run it on 110v shore power or from 12v deep cycle batteries. Looking forward to giving it a trial run soon! 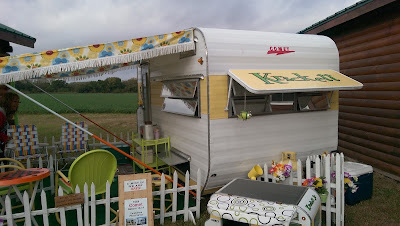 And speaking of trial runs, stay tuned for our first journey, not to a campsite but to a vintage camper show! 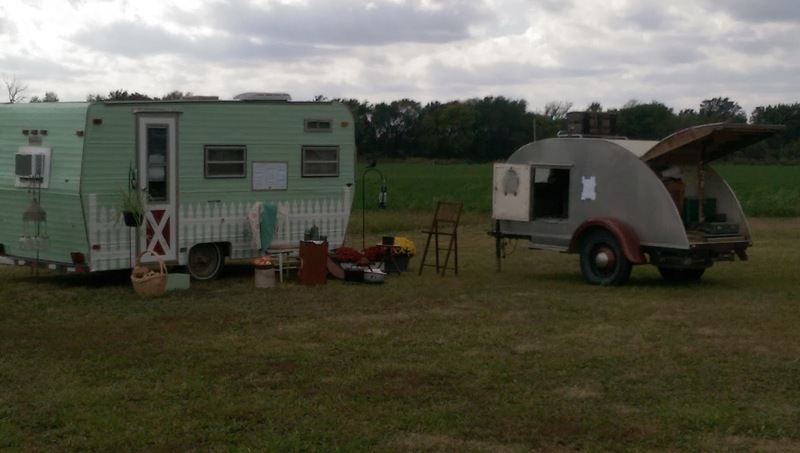 Stone Barn Farm & Cabins in Dexter, KS is hosting the show to be held October 15 and sponsored by SKT. It promises to be amazing, with a dozen other campers already registered. Here's the pic we provided for a sneak peek of Sweet Melissa. We'll bring you up-to-date day of show. The excitement is building!